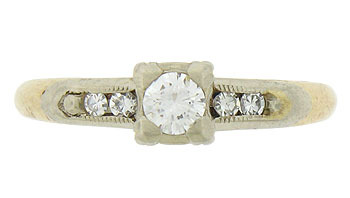 This handsome vintage engagement ring features a dazzling round cut diamond rising from the center of the mounting. 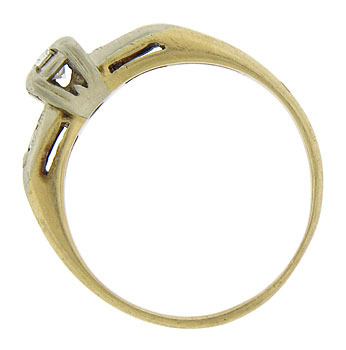 Pairs of additional fine faceted diamonds are pressed into the rings shoulders. 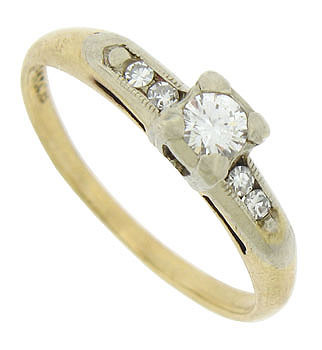 The Retro Modern ring is fashioned of 14K yellow gold, while the shoulders and center mounting are finished in white gold. 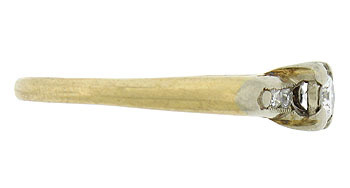 The ring measures 4.58 mm in width. Circa: 1940. Size 5 1/4. We can re-size.